Mistake or Lies? Why did we really go to war in Iraq? Hijacking Catastrophe places the Bush Administration's false justification for war in Iraq within the larger context of a two-decade struggle by neo-conservatives to dramatically increase military spending in the wake of the Cold War while projecting American power globally by means of force. 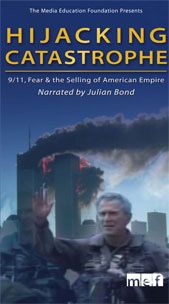 In chilling detail, the documentary exposes how the Bush Administration sold this radical plan to pre-emptive war by manipulating intelligence and exploiting the fears of American people in the wake of September 11. The film is narrated by Julian Bond, and features interviews with more than twenty of the most important political observers of our time, including Norman Mailer, Pentagon whistleblower Lt. Colonel Karen Kwiatkowski, former Chief UN Weapons Inspector Scott Ritter, Daniel Ellsberg, Nobel Prize Laureate Jody Williams, Noam Chowsky, Michael Eric Dyson, Medea Benjamin, Mark Crispin Miller, Vandana Shiva, Kevin Danaher, Chalmers Johnson, Benjamin Barber, and Army Special Forces Master Sergeant Stan Goff (Ret. ).